Check our Facebook page "Shelburne Municipal Recreation & Parks" for the most up to date information about programs and events. Community Use Programs take place at the Shelburne Regional High School and are offered throughout the year. Cick here for program listings and more information about Community Use at SRHS. Art Happening for Seniors is an art based, 4-week program designed for older adults and seniors. Each week a different art project for all abilities is completed with instruction from local artists. Learn to Skate for Adults is a program to learn how to skate or improve skating skills and takes place at the Shelburne County Arena. Kids in Motion Recreational Skating Program is for children in grades 4-6 from Hillcrest Academy. 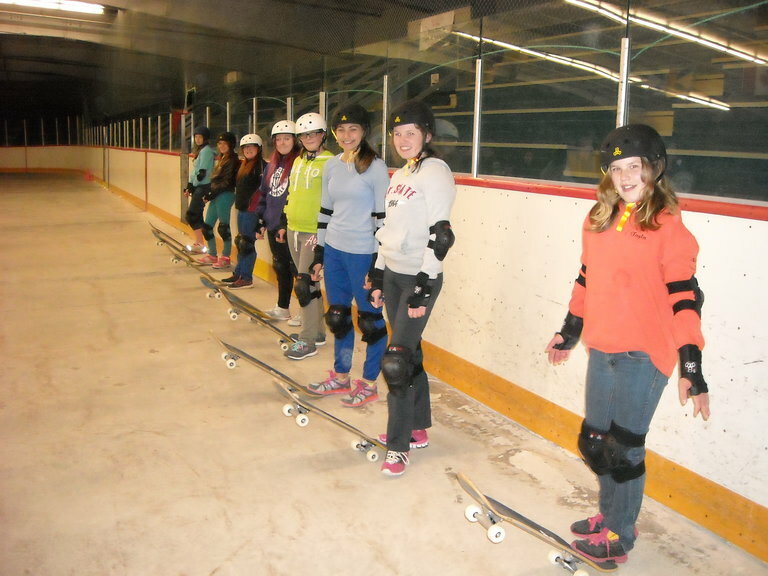 It runs January to February for 6 sessions and provides children the opportunity to learn to skate, improve their skating abilities or learn a new skill. Active Start Basketball Programs are offered to children ages 3-5 and 5-6 for 6 sessions from January to March. The programs focus on teaching fundamental movement skills and basic basketball skills though fun games and activities. Mark Break Activities are offered free to families during March Break. This includes activitites such as public skating, open gym time and outdoor activities. Run Jump Throw is an afterschool program for children in grades 3-6 held in the Spring. It teaches the basic movement skills of running, jumping and throwing through fun, age appropriate Track & Field based activities. The aim is for participants to have fun, gain or improve movement skills and to learn about and experience the sport of Track & Field. Multi-Sport After School Program is a free program for children in grades 2-3. It runs twice a week for 4 weeks and provides an opportunity for children to try out different sports available within our community. Youth Leader Program is for youth in grades 8-10 who are interested in developing leadership skills and gaining volunteer experience, primarily working with children. The program is free and consists of 2.5 days of mandatory orientation/training at the beginnig of July and at least one week volunteering at a Municipal summer day camp during July and August. Recreation Staff will do classroom visits at both SRHS & LRHS in early June to talk about the program and provide the application to youth who are interested. Humans VS Zombies is an epic game of tag for children in grades 4-6 that includes missions which must be completed for humans to survive the Zombie Apocalypse. Held at Islands Park at the end of October, it is two hours of heart pounding fun! Kayak and Canoe Try It Clinics are offered seperately to give people the chance to try them out and learn basic paddling and safety skills. All equipment is provided including kayaks, canoes, paddles and lifejackets as well as any other safety gear.